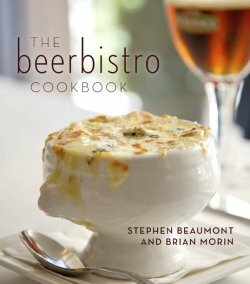 TORONTO, ON – While it has an official release date of April 10, 2009, The beerbistro Cookbook by Stephen Beaumont and Brian Morin – partners in Toronto beer-cuisine restaurant beerbistro – has started shipping from Amazon.ca and is also available for purchase at the restaurant (18 King Street East, Toronto). In beerbistro Cookbook, writer Stephen Beaumont and chef Brian Morin show how you can take your beer to a whole new culinary level. Covering everything from getting to know your ales and lagers to appetizers, mains, cheese, beer cocktails, and even beer pastry, first-timers and foodies will find something to whet their appetites and wet their whistles. Informative sidebars provide tips and hints on everything from how to pour beer to what glassware to pour it into. True-to-life photos will take you behind the scenes to see exactly how these mouth-watering dishes are made. They will make you hungry for more. Recipes include: Blonde Ale Vegetable Pakoras, Grilled Porter, Pulled Pork Quesadillas, Curried Butternut Squash and Ale Hummus, Drunken Portobello Mushroom Sandwich, The Ultimate Frites, Apple Ale Back Ribs, Navajo Spice Rubbed Oatmeal Stout Chicken, Maudite Onion Confit, Beer Butter Tarts, Beeramisu, Stout Macadamia Nut Brownies, and Beerscream.